I am proud to be Canadian. We are a kind and gentle nation of almost 34 million people living in the word’s second largest country by land mass – 6,195,692 square miles. This is a country rich with natural resources and a lot of bright and talented minds. Our best exports have been our people who have done amazing things worldwide. Nice Place to Visit. Nice Place to Live. For as long as they have been doing those surveys, Canada remains one of the most desirable places on earth to live. Canada is the 9th largest economy in the world and 8th biggest trader. It's also the 19th largest beer guzzling nation per capita on earth. If you're interested, the Czech Repulic is #1, Germany is #3 and the U.S. is #13. 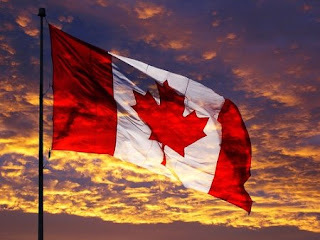 The standard of living in Canada is one of the best and despite our penchant to be overly modest – this place frickin’ rocks! We do like maple syrup like many people from many nations but it is not a daily beverage. Sure we say “eh” but we don’t have the market cornered on that harmless little questioning word. Do we, eh? It is not winter 8 months a year, 99.9% of the population does not live in an igloo and despite it being our second official language we don’t all speak French. I have done a lot of business with colleagues in the States so I have had numerous conversations about Canada with them over the years. It’s always fun to test them on Canadian facts and history – they fail miserably – I laugh and point. It is OUR nation's birthday. Time to pay tribute to a few Canadians who have changed the world. Sir Frederick Banting and partner Charles Best discovered Insulin which has saved the lives of millions of people living with Diabetes. Terry Fox began his Marathon of Hope in 1980 after having one leg amputated because of bone cancer. He lost his battled a year later but to date, the Terry Fox Foundation has raised more than $400 Million for research. James Naismith has been credited as the inventor of basketball. Naismith was born in Ramsay Township; now known as Almonte, Ontario – about an hour outside of Ottawa, which is the nation's capital. Alexander Graham Bell is credited with inventing the first practical telephone. Unconfirmed rumors persist that service charges were introduced soon after that. The baseball glove was invented in 1883 by Arthur “Foxy” Irwin who was born in Toronto in 1858. One hundred and thirty-four years later, The Toronto Blue Jays won their first of two World Series. Canadian legends from a very long list include: Norman Jewison, Leonard Cohen, John Candy, Michael J Fox, David Cronenberg, Pierre Burton, Celine Dion, Paul Shaffer, Mary Pickford, Leslie Neilson, Arthur Kent, Matthew Perry, Gilles Villeneuve, Frank Gehry, Gordon Pinsent, Dan Ackroyd, Jack Warner, Norman Bethune, Monty Hall, Jack Kent Cooke, Mike Myers, Ali Velshi, Margaret Atwood, Morley Safer, Stephen Leacock, Wayne Gretzky, Donald Sutherland, Doug Henning, Russell Peters, Ivan Reitman, Alanis Morissette, Sir Sandford Fleming, Howie Mandel, David Suzuki, Rick Hansen, Phil Hartman, Sandra Oh, Keanu Reeves, Peter Jennings, Neil Young, Steve Fonyo, Martin Short, Mario Lemieux, John Roberts, Jim Carrey, Alex Trebek, Brendan Frasier, Bryan Adams and thousands more. And to my colleagues and friends elsewhere; yes there is a big difference between “table syrup" and "maple syrup" and it is deelish.